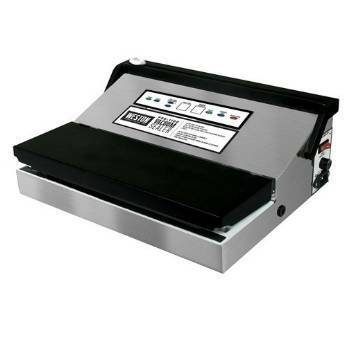 Weston Products Pro 1100 Vacuum Sealer features a stylish black design with brushed stainless steel lid and seal bar. While a compact sealer, it is powerful with a 680 watt motor and a double piston vacuum pump that delivers 28.5 inches HG vacuum strength. Seal bags up to 11 inches wide using automatic mode. Or, if you prefer, use manual mode which allows you to control vacuum pressure for more delicate foods. The Pro 1100 also has a built-in bag holder and cutter, a fully adjustable sealing time function, an LED progress light, a built-in cooling fan, detachable power cord, and side mounted vacuum port for vacuum canisters (canisters sold separately). Please note: All Weston Vacuum Sealers are “out of chamber” sealers. As with any “out of chamber” sealer, regular household bags and all other non-textured or non-embossed bags are not compatible and should not be used. For best results, bags containing a textured or embossed lining are required.